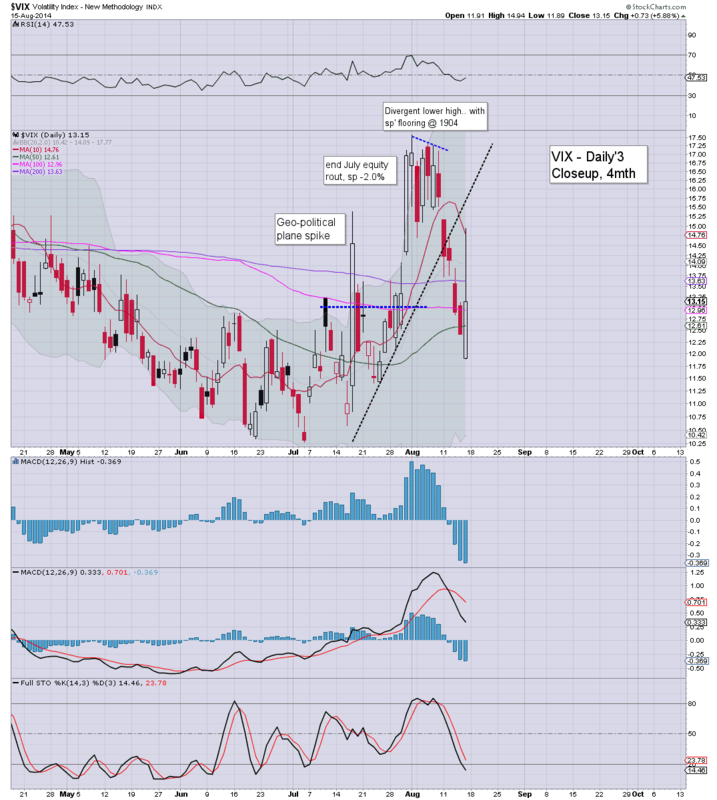 With US indexes being spooked by Ukrainian news, the VIX climbed into the weekend, settling +5.9% @ 13.15 (intra high 14.94). Near term outlook is for 15s on Monday, before resuming lower to the 11/10s. 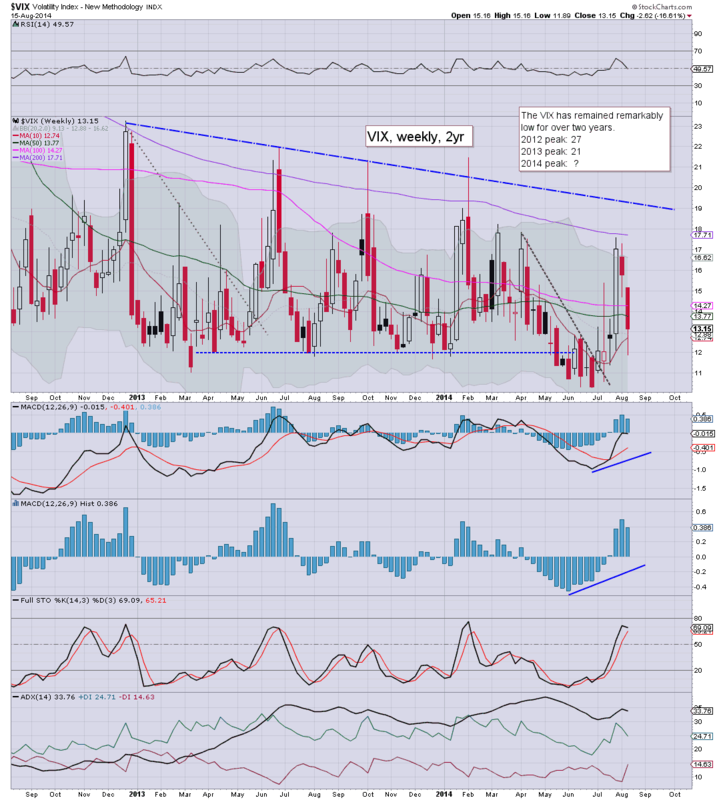 Suffice to say, despite the Friday gains, the VIX still saw net weekly declines of -16.6%. I would expect to see some further gains next Monday - along with the sp'1930s, before the VIX resumes lower across much of next week. 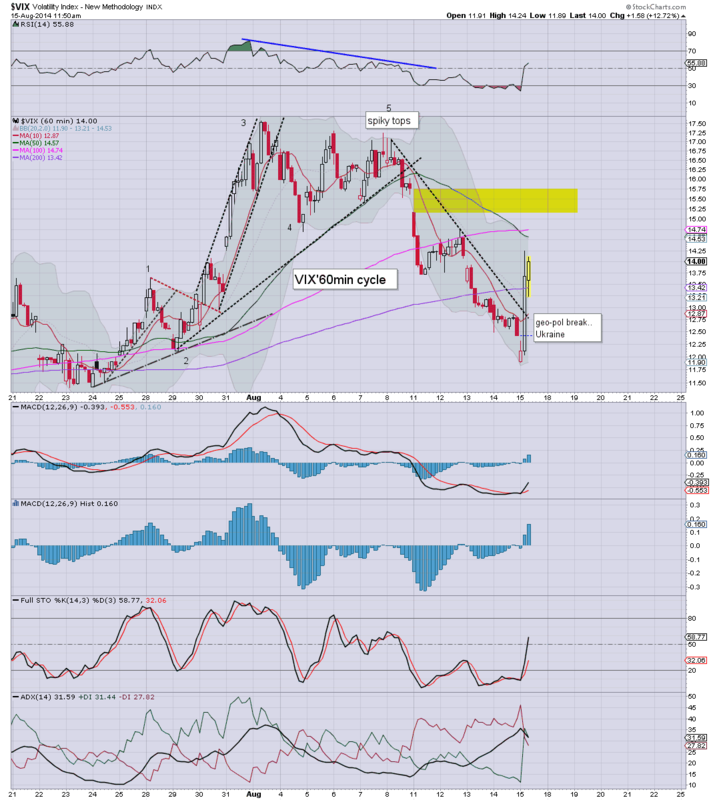 Whether single digit VIX will occur - if sp'2000s... difficult to say. US indexes closed the week on a negative note, having been spooked by more Ukrainian news, sp'500 u/c @ 1955 (range 1964/41). The two leaders - Trans/R2K, settled u/c and -0.1% respectively. 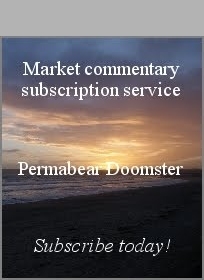 Near term outlook is for Monday weakness, before renewed upside. ...and another crazy week in market land comes to a close. Certainly, we didn't see the selling into the close that I was anticipating. However, price structure is a pretty clear bear flag, and it does bode for some downside next Monday. I am glad to be on the sidelines over the weekend (I'll sleep easier for it! 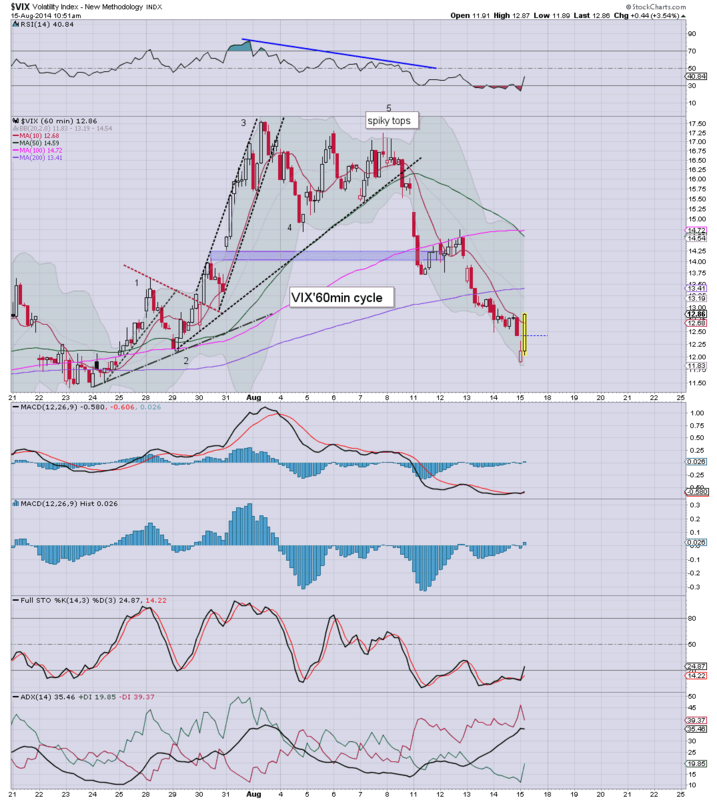 )..and I'll be looking to go long in the 1930s.. with VIX 15s. The market remains concerned about what might happen across the coming weekend, and there will be a very natural bias to the downside into the weekly close. Metals remain weak, Gold -$8, whilst Oil is higher by around 1.1%. *a somewhat vain attempt to fathom the micro cycles.... regardless.. this afternoons bounce looks about done. I see next to zero reason why there won't be at least some degree of selling into the close. After all, just who is going to want to be long across the weekend? *I remain content on the sidelines, and will be seeking to go long next Monday.. somewhere in the 1930s. 3.07pm... market rolling lower... for me, the only issue is whether the VIX closes in the 14s...or 15s. 3.22pm.. not exciting ...yet.. but a daily close in the mid 1940s... still very viable.. which will offer the 1930s on Monday. 3.38pm... back to 1954... and even I'm surprised at this late day lunacy. 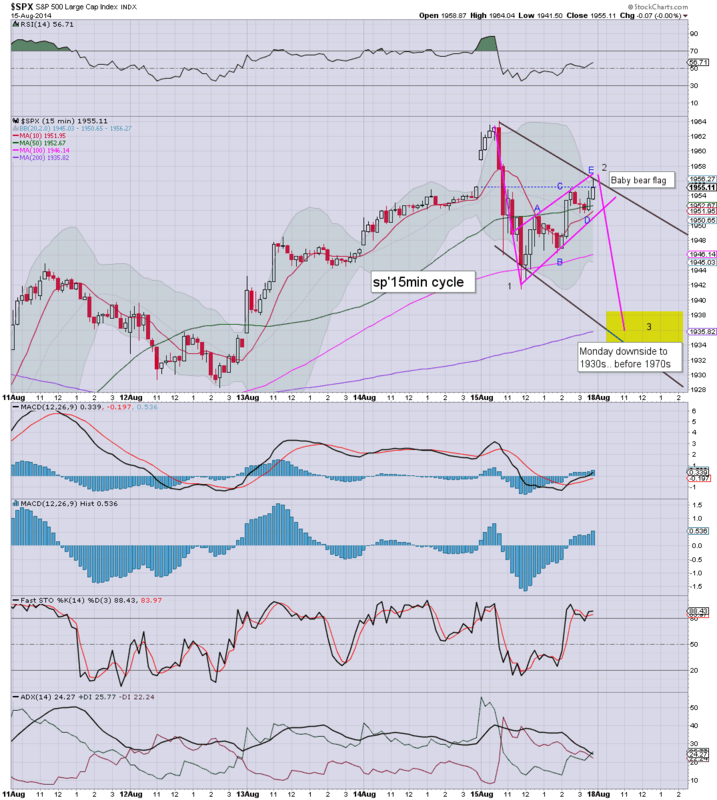 US equities remain weak, and we have a micro bear flag setting up on the smaller 5/15min index cycles. More than likely, we'll see the 'rats sell into the weekend'. 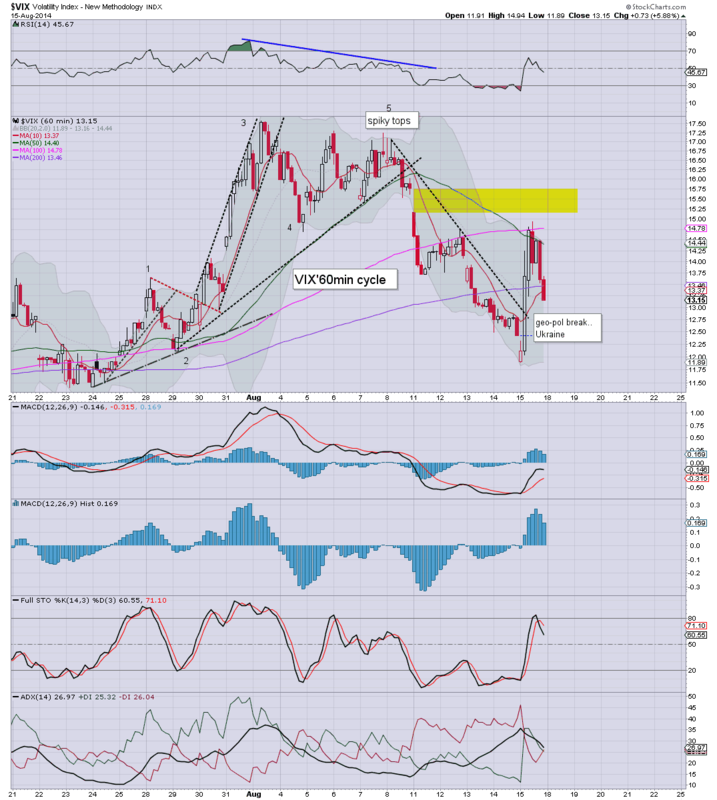 A daily close in the sp'1930s, with VIX 15/16s now seems viable. So... best guess.... weakness for the rest of the day. No doubt, if we do close at the lows of the day, then the 'end of the world' crowd on Zerohedge will be in an especially crazed mood. Unless we break <1904... primary outlook remains to the upside. yours... on the sidelines... where it is rather comfortable right now. Still seeking weakness into the close. maxed at 1954... at the typical turn time. US indexes remain weak, but considering the 'spooky' news from the Ukraine, the market is holding together relatively well. VIX is battling to break into the 15s. Metals remain weak, but well above the earlier lows, Gold -$8. *fib retrace from 1964/1928...so far holding around the 61% level... 1941. Hourly chart is now a bit of a mess. We have a break of channel..and we've broken below the high of what some might call a sub'2 at 1944. For me, the first sign of 'real trouble' would be sp <1925...along with VIX 16/17s. The big picture outlook would change if sp <1904.. and VIX 18s. If that occurs, then 1991 would likely not be surpassed for remainder of the year. 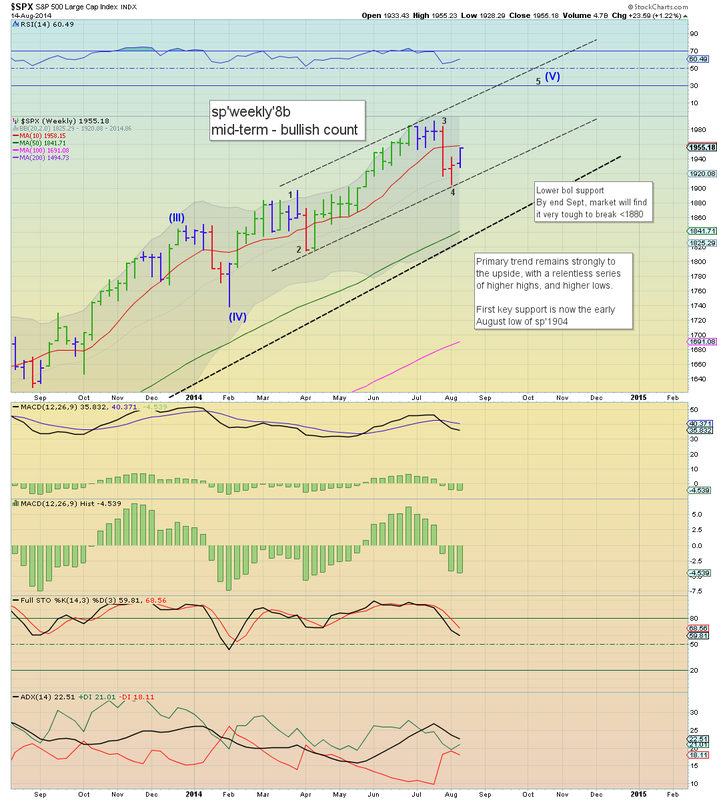 Keep in mind, the giant monthly cycles on both US and most world indexes are rolling over. US equities remain somewhat spooked by news that Ukrainian artillery have fired on a Russian military convoy. VIX has swung from -2% to +13% into the low 14s. Metals are rebounding, Gold -$7. Perhaps most notable right now.. we have bearish engulfing candles on most of the daily charts. Certainly, this mornings reversal does bode for further weakness next Monday. As things are... unless the news gets really scary across the weekend, it is merely another pull back to be buying. *I will remain content on the sidelines across the weekend. 12.16pm.. chop chop... but then.. it is opex. So.. bears have managed a reversal...but how about the weekly close? As noted yesterday, bulls should be content with the 1940s... that'd still make for a net weekly gain. Notable weakness: R2k, -1.0%.... almost a full 2% swing from 4hrs ago. Equities appear to have seen a morning peak of sp'1964, and we are seeing a micro snap lower - on a Ukrainian news story. Equity bulls just need to hold the sub'1 wave high of 1944. Metals remain very weak, Gold -$14. ...an interesting reversal underway...due to a 'spooky' news story. It would appear the Ukrainians have fired on some kind of incursion from Russia. 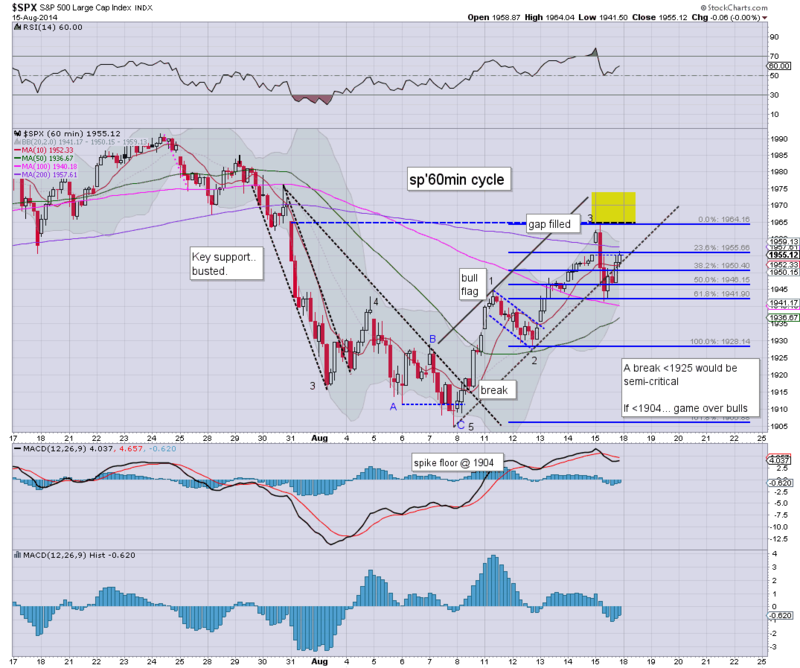 I've added a speculative count to the hourly chart. Bulls just need to hold within the channel..and >1944. Seems likely. Regardless, I ain't shorting anything....and I will not be getting involved again until next Monday. If 1944 fails...then strap in...otherwise...its just a brief scare. 11.07am... No critical damage...yet.. but the news from Ukrainian is genuinely a major issue...and markets are justifiable spooked. Who wants to hold long into the weekend now? For me, I wouldn't get remotely interested on the short side unless we broke <1900..and that sure doesn't look likely. Anyway...interesting morning...long afternoon ahead.. as market looks to more updates on Ukraine. 11.39am.. Notable weakness in the R2K -0.5%...after being +0.9% in pre-market. 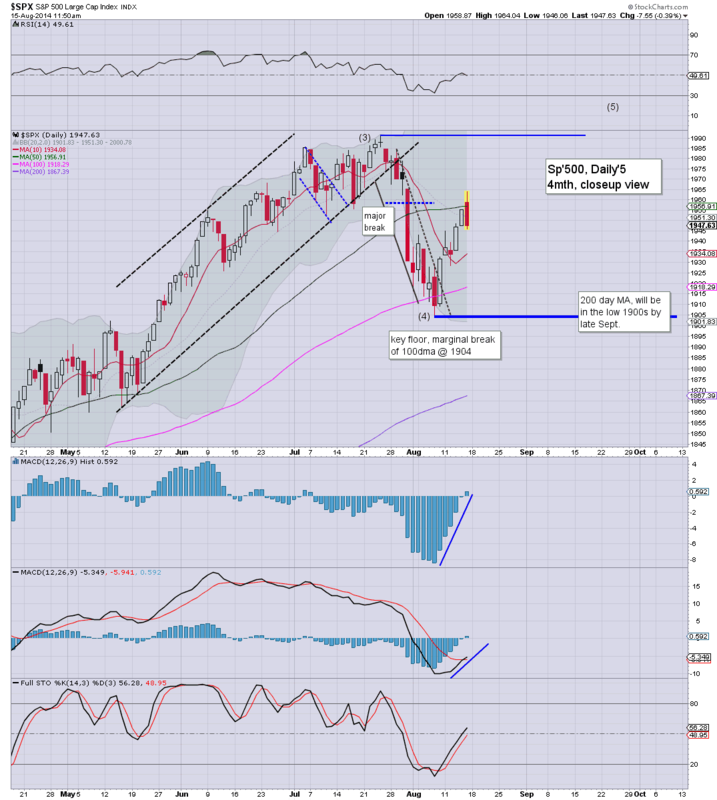 Bearish engulfing candle....bearish for the broader market next Monday. 11.47am.. considering the news.. it never fails to surprise me that we're only -0.3%. US indexes open moderately higher, with the sp' breaking above the 61% fib retrace from the 1991 high. Weekly 'rainbow' candle turns 'outright bullish' green. The metals are ending the week significantly lower, Gold -$17, with Silver -1.5%. The smaller cycles are getting overbought..and we could slip lower for a few hours, but I don't think it merits any attention from the bears. 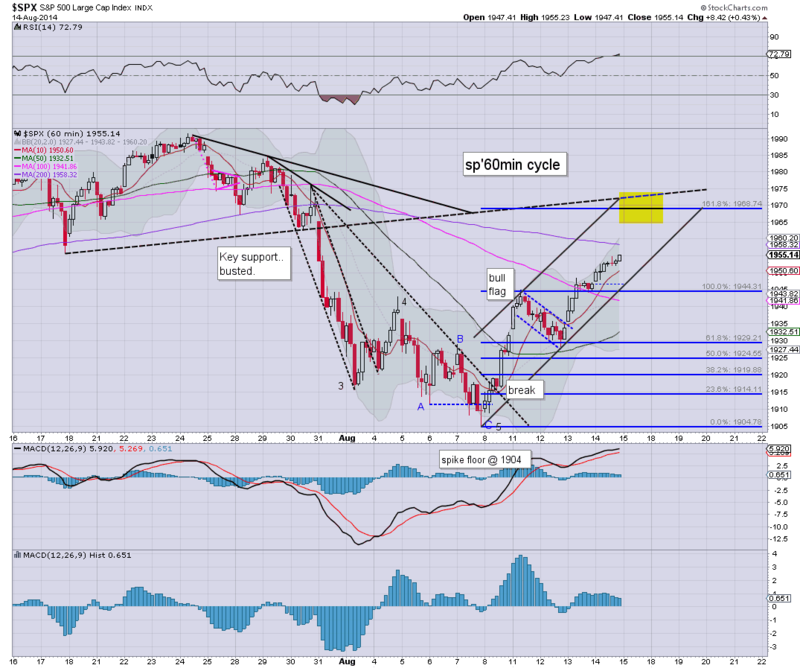 The green candle on the weekly cycle is in my view a huge victory for the bulls, and clarifies the bigger picture. We're headed for the 2000s. **I am more than content to sit on the sidelines across the weekend. 10.21am.. minor chop around sp'1962/63. ...only another 4% to go....but that will likely take a good 4-5 weeks. Good morning. Futures are moderately higher, sp +6pts, we're set to open at 1961. 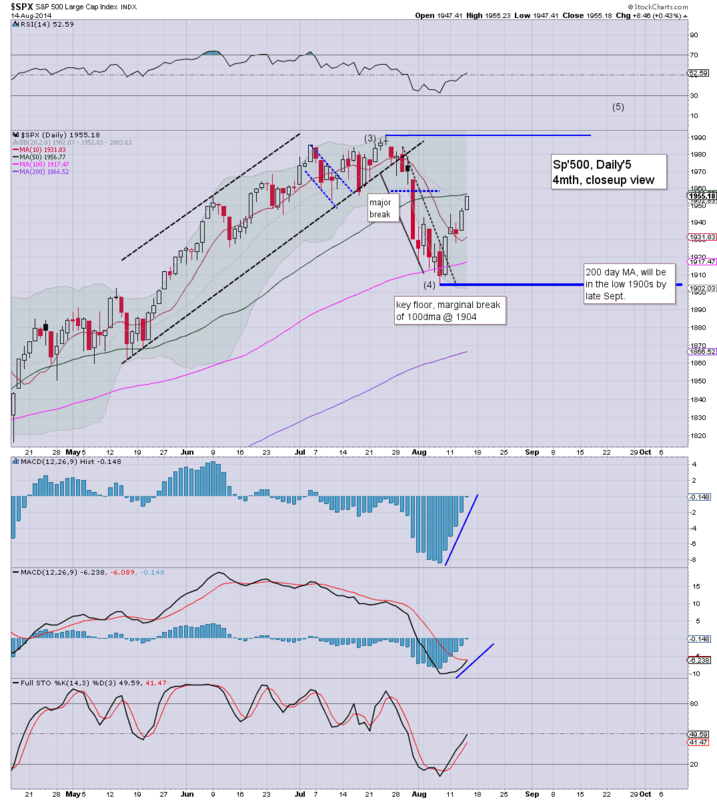 A daily/weekly close above the 50 day MA of 1955 would clarify that new historic highs are very likely in most indexes. So, we're set to be trading in the 1960s at the open, and a slow grind to 1970 seems very viable today. Notable strength: R2K, +0.7%. Upper bol' on the daily offers the low 1160s, which would make for a daily gain of 1.5%.... suggestive the broader market will claw to sp'1970, with Dow 16800s. *as things are, I'm tired.. its been a long week, and I might get intentionally stopped out at the open. 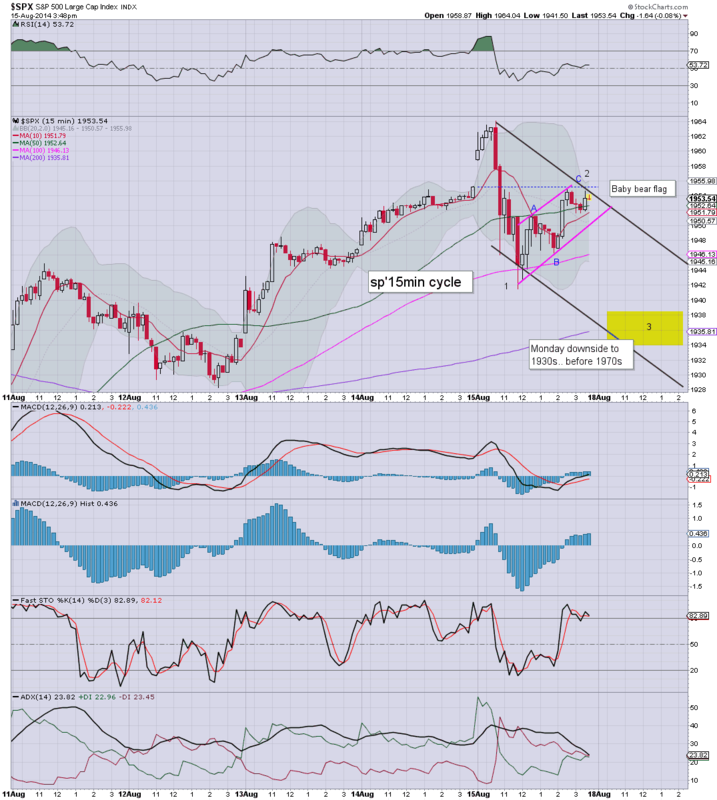 Not surprisingly, Oscar is bullish, and expecting new yearly highs. Good wishes for Friday trading. From there...I'm done for the week. 9.35am.. EXITED sp' LONG.. from 1962. ..and my week is complete. I will stick around here though. 9.37am.. VIX slips into the 11s..
Weekly 'rainbow' candle turns GREEN.... indexes back to outright bullish. US equities managed the fourth daily gain in five days, and the recent low of sp'1904 continues to fade away into the distance. The giant sp'2000 threshold looks very viable in September, with the monthly cycle offering the 2030/50 zone. 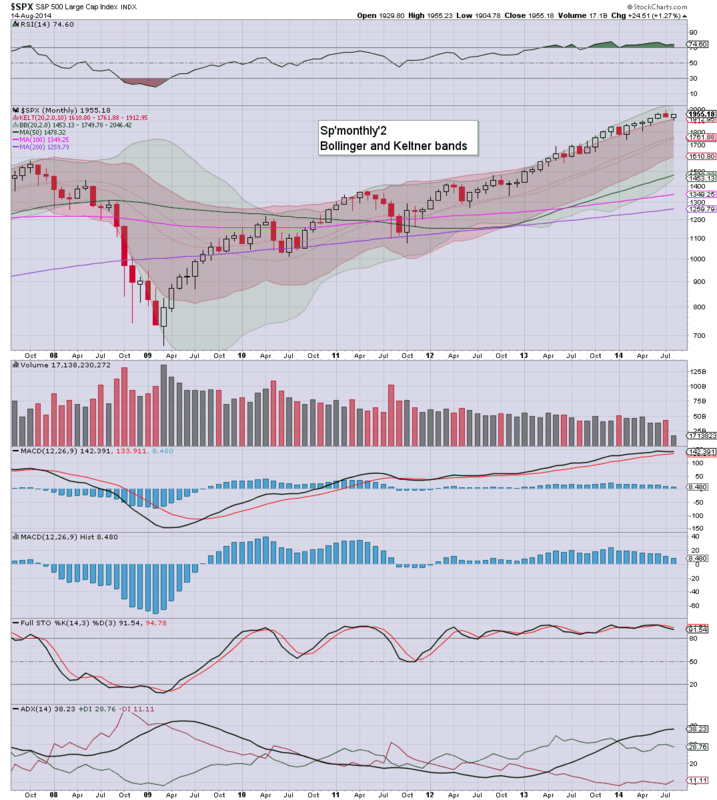 *note the upper bollinger on the monthly cycle..currently in the 2040s. That is a very viable target for next month. The weekly candle continues to hold blue. I'm unsure as to what level would be necessary for it turn green. On any basis though, this week has been one for the bulls. Price structure looks pretty strong, and the VIX is reflective of a market that is much calmer. There is an array of econ-data tomorrow. If much of that comes in at least 'reasonable', then market should have a high opportunity to break into the 1960s...and melt higher into the afternoon. Friday is opex, and normally I would look for mild chop across the day. 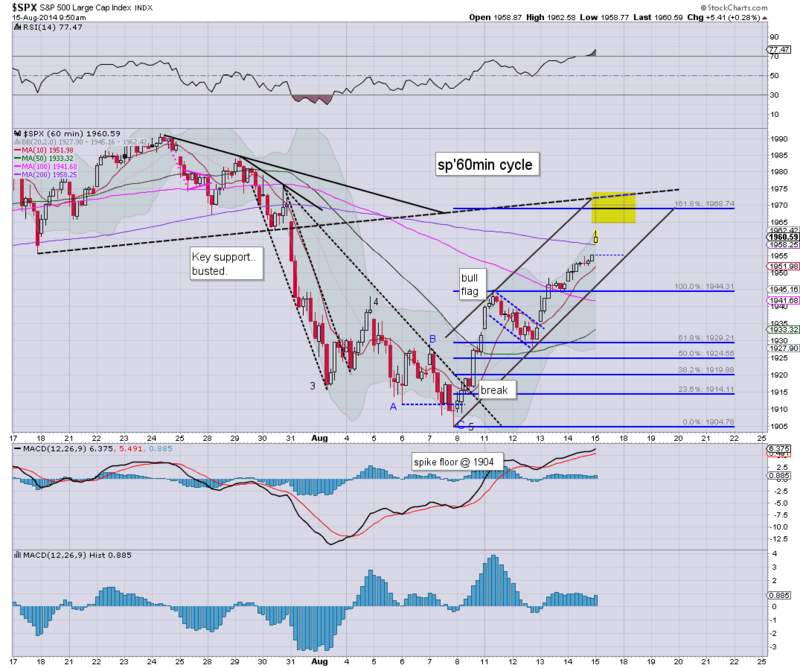 However, the recent rally from the sp'1904 low looks set to continue. A break above the 50 day MA of 1956 looks a given, which will open up the 1965/70 zone. I continue to hold long, but as ever, I will look to exit into the weekend. 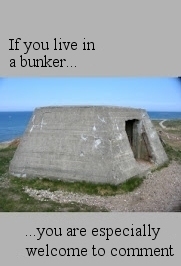 As an options trader, this is almost always a good idea. If the IHS scenario is correct (not that I was calling for it), then we won't stop climbing until the 1980/90 zone. Regardless, I'll be more than content with an exit in the mid/upper 1960s tomorrow. US indexes closed higher for the fourth day in five, sp +8pts @ 1955. The two leaders - Trans/R2K, settled +0.7% and +0.1% respectively. 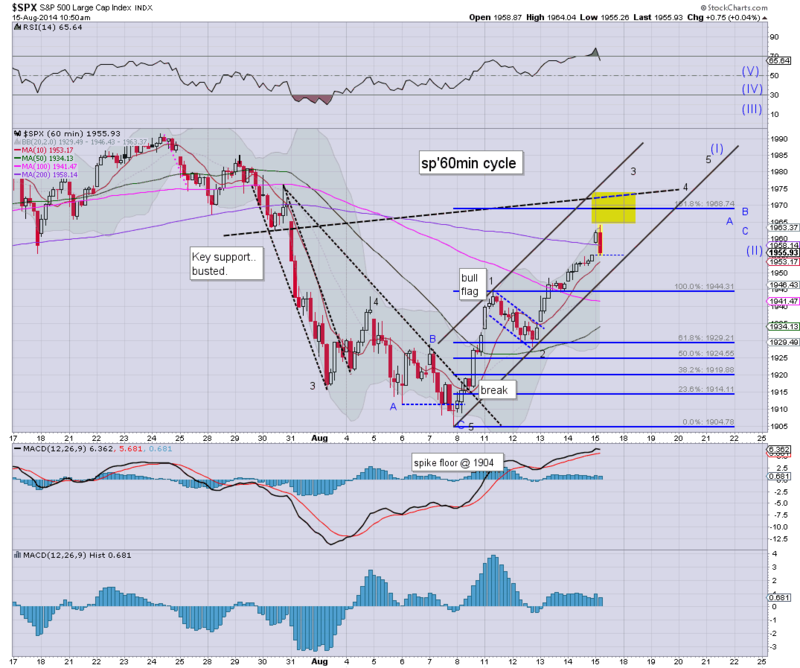 Near term outlook is for sp'1965/70 zone.. before the first chance of a minor retrace. The 2000s look very likely in September. 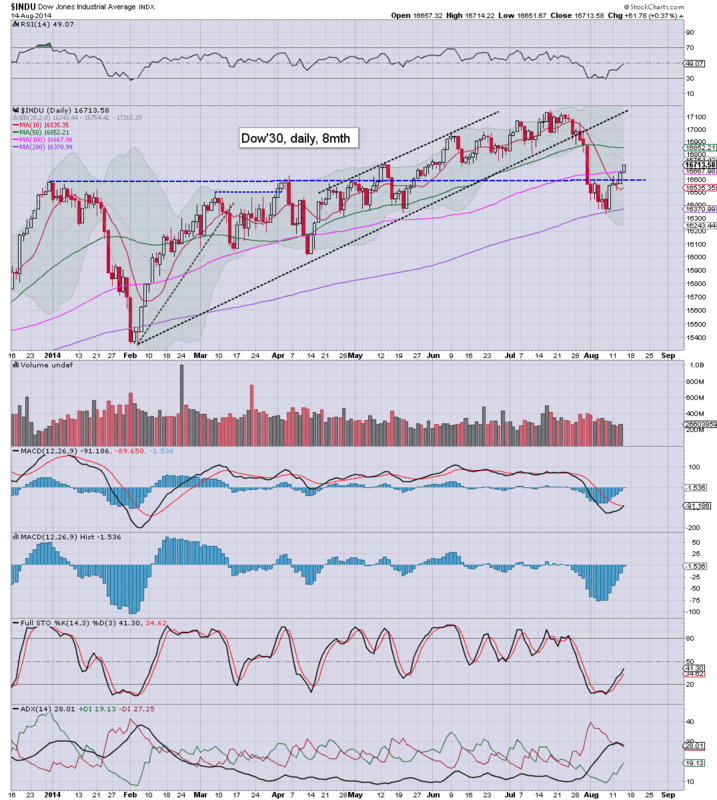 Dow looks set for the 50 day MA in the 16850s... which would likely equate to sp'1970. Those who are looking for an IHS... should be seeking a retrace from 1980/90s...down to 1950/40.